Paul and Sharon Guenzler of Ronan are pleased to announce the engagement of their daughter, Sarah Michelle, to Eric James Crimmins, son of Jim and Nancy Crimmins of McClusky, N.D. The bride to-be is a 2005 graduate of Ronan High School and graduated in 2010 from Montana State University in Bozeman with a bachelor’s degree in agriculture education. The groom is a 2007 graduate of McClusky High School in South Dakota and graduated in 2009 from Bottineau Community College in Bottineau, N.D. with an associate of science degree. Sarah is the granddaughter of Leona and Vern Frisk of Pablo, and George and Sharon Guenzler and Laura Frisk, of Ronan. Eric is the grandson of Leroy and Arlene Bentz and Armin Heinle of McClusky, N.D. and Jan Heinle of Saratoga, Wyo. 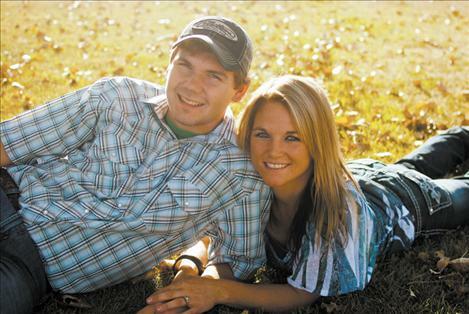 Sarah and Eric both work as custom crop applicators for the Co-op Elevator of McClusky, in South Dakota.